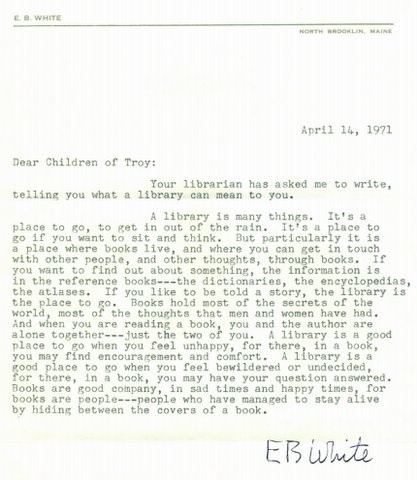 We'll begin this week with a new letter in support of Troy Public Library and some exciting news: our "Tell Two Friends" suggestion made its way around the globe to Brisbane, Australia. As a librarian in Australia, I was distressed to discover that your town was holding a vote on whether to continue operating a public library or not for your citizens. I ask you, would a vote be tabled to continue/discontinue refuse collection, roadworks, water sanitation? Libraries are a basic right in a free society. Without free access to information for all it's residents how can a government call itself democratic? Those with the least power and resources will be the worst affected by the library closure, pushed further to the margins of a society which no longer wishes to acknowledge, let alone assist them. Society's should be judged by how they treat the most vulnerable. To close Troy Library is to leave the Troy City Council open to harsh condemnation, internationally. Libraries are a public right, as civil servants, why are you not upholding this? Thank you Carolyn, we're excited that people are listening and working to save libraries all over the world! Detroit Free Press Article "Notes from famous people could help save Troy Public Library"
One campaign flyer says: "Dr. Seuss, Ronald Reagan and E.B. White are among the people who have supported our children's library. Now the question is ... Will YOU?" Who supports the millage? (We'll add to this list each week, because the list is growing!) League of Women Voters, Troy Chamber of Commerce,Troy School Board. 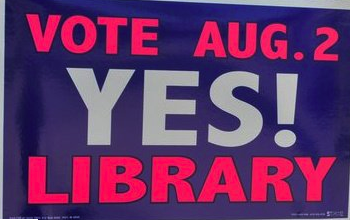 "As a supporter of lifelong learning and higher education, we feel so strongly about this issue and appeal to all Troy residents to support our children’s future by voting YES for the .7 dedicated library millage that will be on ballots August 2, 2011. 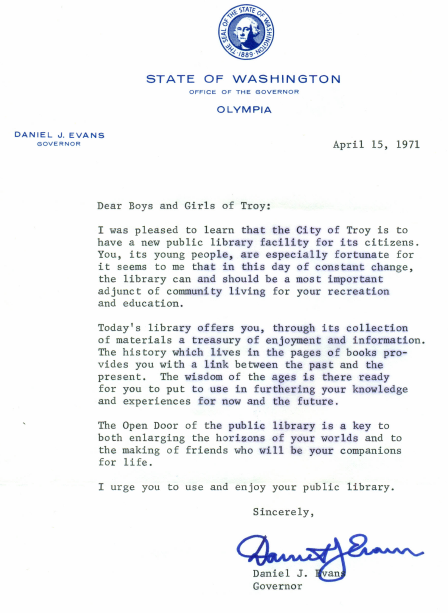 It is critical to the future of Troy, it is critical to the future of our children, and it is crucial to lifelong learning that the city continues to have a fully functional resource library for all. What's Happening at Troy Public Library and how can you help? Live in Troy, but not going to be in town on August 2nd? No problem, get your absentee ballot, details here. Before you get on with your day, even if you don't live in Troy you can help: just tell two friends, just two, tell them to tell their friends to pass this message to the people of Troy "VOTE YES August 2nd and Save Troy Public Library!" Send this message on, we're watching how many hits we get in Troy, the numbers are rising --our message is getting out, thanks for helping Save Troy Public Library. 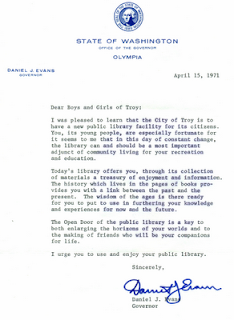 I was pleased to learn that the City of Troy is to have a new public library facility for its citizens. You, its young people, are especially fortunate for it seems to me that in this day of constant change, the library can and should be a most important adjunct of a community living for your recreation and education. Today's library offers you, through its collection of materials a treasury of enjoyment and information. The history which lives in the pages of books provide you with a link between the past and the present. The wisdom of the ages is there ready for you to put to use in furthering your knowledge and experiences for now and the future. The Open Door of the public library is a key to both enlarging the horizons of your worlds and to the making of friends who will be your companions for life. I urge you to use and enjoy your public library. 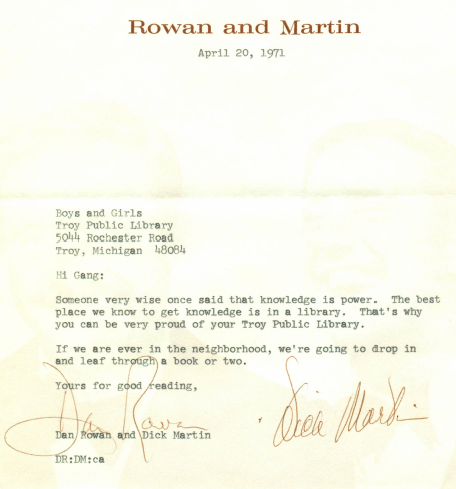 Who are Rowan and Martin? Someone very wise once said that knowledge is power. The best place we know to get knowledge is in a library. 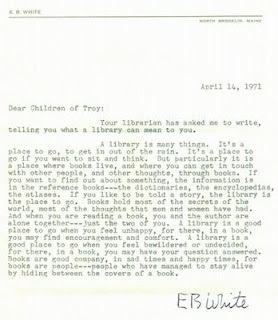 That's why you can be very proud of your Troy Public Library. If we are ever in the neighborhood, we're going to drop in and leaf through a book or two. Your librarian has asked me to write telling you what a library can mean to you. A library is many things. It's a place to go, to get in out of the rain. It's a place to go if you want to sit and think. But particularly it is a place where books live, and where you can get in touch with other people, and other thoughts, through books. If you want to find out about something, the information is in the reference books---the dictionaries, the encyclopedias, the atlases. If you like to be told a story, the library is the place to go. Books hold most of the secrets of the world, most of the thoughts that men and women have had. And when you are reading a book, you and the author are alone together---just the two of you. A library is a good place to go when you feel unhappy, for there, in a book, you may find encouragement and comfort. A library is a good place to go when you feel bewildered or undecided, for there, in a book, you may have your question answered. Books are good company, in sad times and happy times, for books are people---people who have managed to stay alive by hiding between the covers of a book. Come back next Tuesday for more. This week The Mom couldn't add as many letters because today is The Big Sister's 11th birthday and she wants to spend the day celebrating! Happy Birthday Big Sister!!! 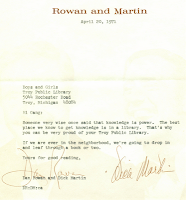 *Letters shared with permission from Troy Public Library.